Finally it seems things are back to normal. Or course it seems that normal isn’t very normal these days. Susanna didn’t have to work tonight, and I was able to get out of work at a good time (don’t worry, the next couple of days will make up for it at work – followed by a quick trip to the Bahamas for work). A quick project completed in the workshop. A coin holder/display made from scrap cherry. I had a couple of quiet hours in the workshop. I had been building cutting boards a a group project in addition to a bunch of house projects. The workshop was a mess. Sawdust everywhere. Tools blanketing all the horizontal surfaces. The first project was to clean up the workshop, put tools away, and vacuum the floor. I then took an hour to make a coin holder that I promised to a friend – I have an opportunity to give it to him tomorrow, and I had been stalling building it. But coin holders are quick to build, and I finished it with a coat of shellac followed by a water based topcoat. Over the weekend I had picked up 24 white banquet chairs for a little more than $2/each (no point in renting them for the wedding if I can buy them for less than the cost of renting chairs). A couple of the seat cushions had come unattached from the chairs. Ten minutes of work, and all of the seats were attached. 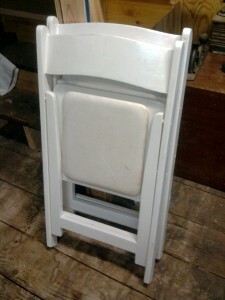 Banquet chairs with seat cushions reattached. Ready for me to bring them to the loft for storage (when I'm not feeling lazy). It is nice to finally be able to spend an evening getting the shop put back together, cleaning up and putting away tools. I still need to spend some time sharpening chisels and hand planes, but that is another night. Two weeks ago I sent off one of my backsaws (a Disston 12 inch backsaw, 13pts) to Matt Cianci at the Saw Blog to get it sharpened. He received the saw and tonight gave me his estimate to get it sharpened. In 4-6 weeks I should have it back, cleaned, polished and sharpened as a sash saw (should be good for both ripping and crosscutting). I took a saw sharpening class from him last year, but don’t sharpen saws enough to be fully proficient at it. I would rather cut wood with the saws and pay him to sharpen them. 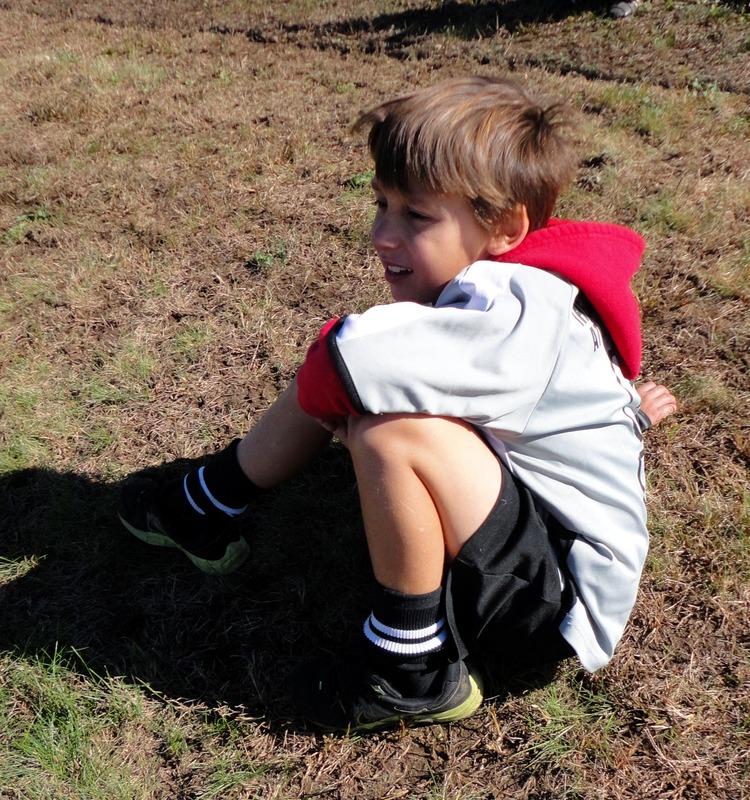 We had a good, cold, soccer morning on Saturday. Both boys had games, but this week Ben’s game was early, so we had to be at the soccer field by 9am. Which meant no lounging around in the morning as we had done the previous two Saturdays when Will’s game was the first one at 10:30. It was also cold. The house thermometer said 24 degrees (-4°C) when I woke up. We had a good hard frost on the ground – no more peppers from the garden (which another post topic – however not a post that I will plan on writing unless really bored). Ben’s game was great. He played goalie the first quarter, letting in only only one goal. By the second half his team was tied 1-1 and he had moved to playing forward where he scored the winning goal (they won 2-1). Will played a good game as well. He rotated between positions, and was able to get two shots on goal while playing forward. It has been a very busy couple of weeks. I have too many projects going on around the house and workshop right now. I am making progress on all of them, but it would be nice to have a couple more get completely finished. The cutting boards are moving along. It is a learning experience as they get made. I made a set of them for my cousin’s wedding, but haven’t yet made any for our own house. I’m also walking a group (one at a time) though making the boards. It is a lot more nerve wracking to be helping someone else on their project. However, I think we will be able to get 4 cutting boards each (two pairs) from the lumber I ordered. There may even be enough for a spare pair – in case we mess up one of them. The first step was to glue up the maple into panels big enough for each board. That was done in the first drunken cutting board posting. James Russell and I made up the first half of the blanks, and we made the first 4 boards. Benjamin Wang and I made the second set of postings (and Ben took pictures to document the steps). 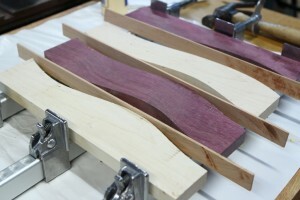 After the glue-up, we paired up boards – one of the purpleheart and one maple. The boards were squared up on the tablesaw, and planed to the same thickness. 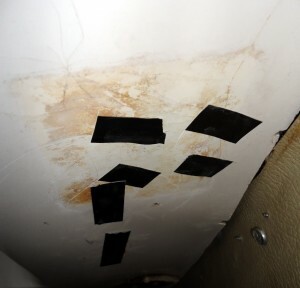 The boards were taped together with double sided tape. Ben figured out to use blue painters tape first to prevent the double sided tape from leaving residue on the wood – based on a suggestion from a worker at one of the big box stores. 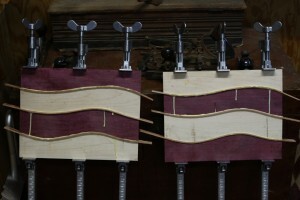 The pairs of boards were then run through the bandsaw and cut into wavy strips. 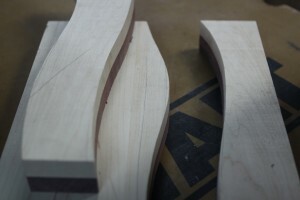 The cuts were then very carefully sanded to try to remove the bandsaw marks without changing the shape of the cuts. After the boards were sanded, we carefully separated the pairs, and placed the boards back on top of each other in the same order they were cut, with the maple on the top and the purpleheart on the bottom. We then took every other strip of wood and swapped the top (maple) with the matching bottom (purpleheart) to give the first part of the wavy pattern. 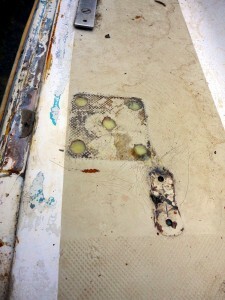 The top and bottom boards were then (being careful to keep them in order) separated. 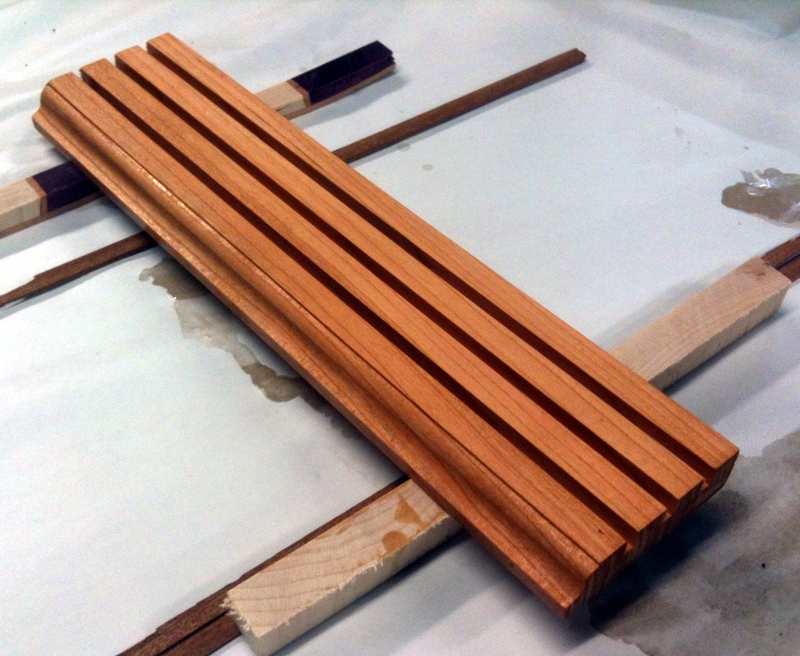 We then added thin strips of cherry between the pieces and glued up the boards. 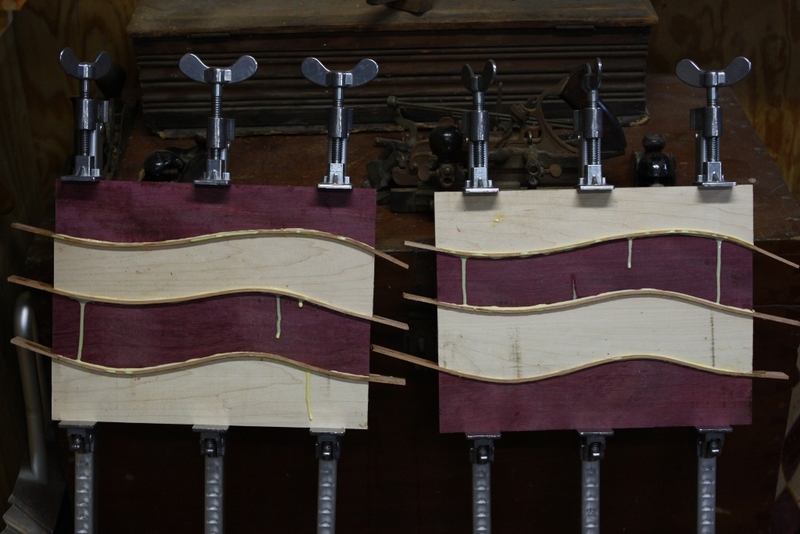 The boards were clamped up and left to glue overnight. 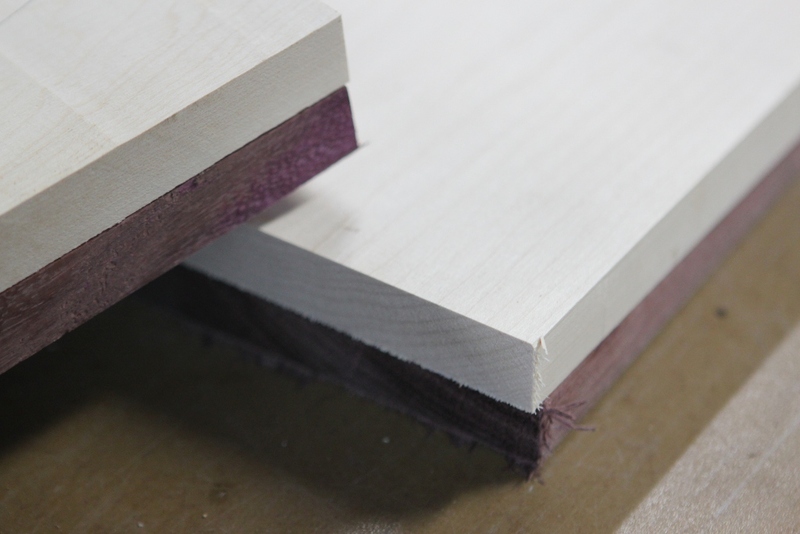 The next day, we cleaned up the boards, cutting off the excess cherry, and planing the boards (carefully) to a standard thickness. The next step was to again pair up the boards and repeat the cuts in the other direction. We didn’t get any pictures of this step. 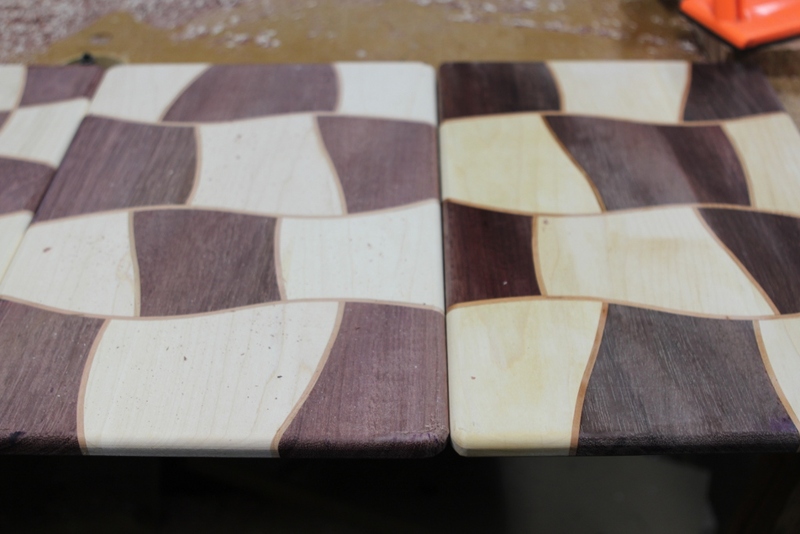 I’ll try to photograph it when I make the next set of cutting boards. Overall, this hasn’t been a terrible project. It takes a couple of hours for each pair of boards to be made, and each set we make gets a little easier. I can’t take credit for this idea and method – I got it off a posting at lumberjocks.com. Yesterday was a pretty good day. The boys had a half of a day at school, so I took the afternoon off of work. We had the piano tuned, which made Susanna very happy. Ben even got back on the piano and practiced for the first time in six months. It took the tuner a couple of hours, and the piano isn’t perfect. But it is much better. 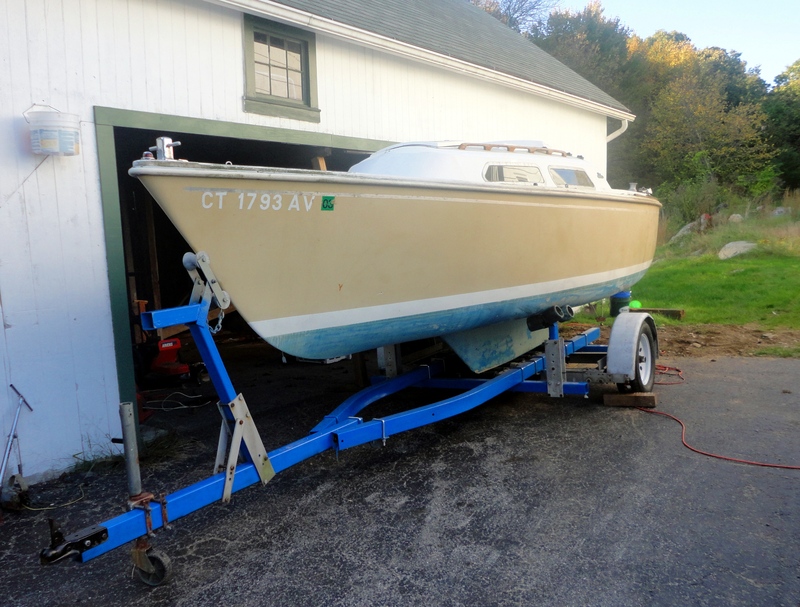 Sailboat moved out of the garage - success!!!!! And after much work, I switched out the flat tire on the boat trailer, and then with everyone’s help, we pushed the trailer out of the garage. 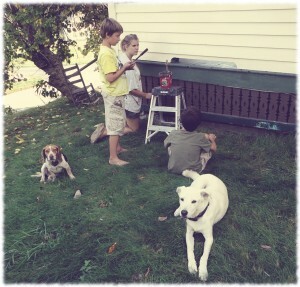 Today the boys have soccer games this morning, and this afternoon may be nice enough to get some chores done. Maybe even light off a fire in the fire pit. It has been a very busy two weeks. Susanna has been working most evenings (or so it seems) as well as going to school full time during the day. I have been working on “drunken cutting boards” as a project with a group from work, which leaves the workshop in need of a cleaning (and I’m pretty sure the tools in need of sharpening). 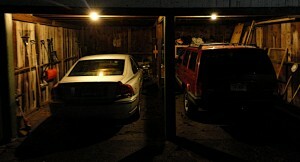 I’m still working on power to the garage. 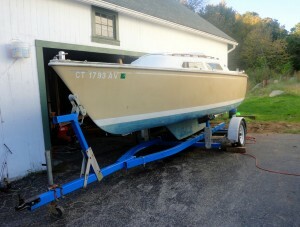 Hopefully that will be finished this weekend – getting power out – not the wiring completely.